After April short position, DASH market had been following a bearish sentiment. Crossing down the 200-day MA, DASH/BTC nears a key support level of 0.022 BTC. Despite the fall, the 200-day MA still acts as a defensive line for DASH/USD pair. However, both markets respect a falling channel. The price of DASH had been falling for the past weeks due to the selling pressure in the market. As a result of this, the market has been down by roughly 18% as price currently trades at $123 level. The volatility of the cryptocurrency appeared low with choppy price action. Following the medium-term bearish correction, DASH is still respecting the bulls’ defensive line; the 200-day moving average line (yellow). Meanwhile, the $125 price level has been holding the bulls for the past twelve days. A successful breach might take price to $130. As shown on the RSI, the trend is positioned at 56.8 level. 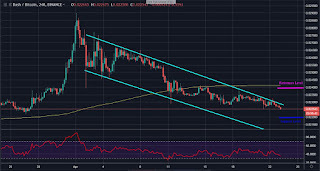 The next major resistance is at $135 level which is outside the channel. A bearish move could slump price to $115support. 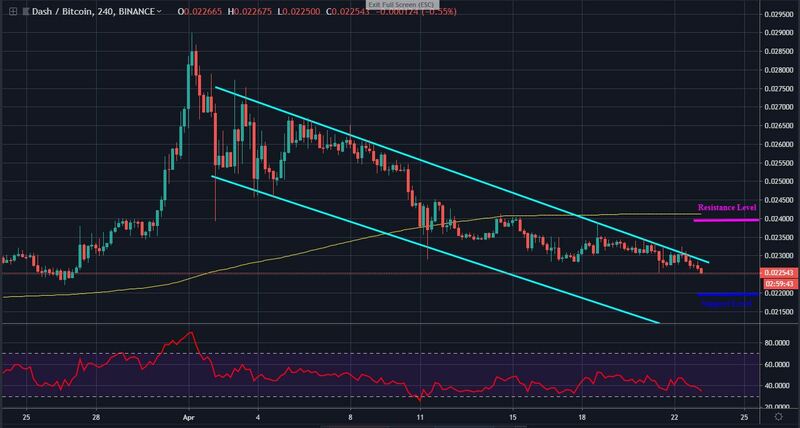 While staying above the important 200-day moving average line (yellow) in late March, DASH price rose to the peak of 0.029 BTC high before plunging in a channel. Testing the yellow line on April 12, a significant break has further led the bears far below the yellow line. Currently, the cryptocurrency head towards the March support at 0.022 BTC level. At the test of the mentioned support, a possible bounce up may occur for a bullish reversal. If a bounce up fails, a break down could further the trend in a more bearish condition. The medium-term RSI is now trending below the 50 level after the price drop on April 1. A successful break up could kick-start a bull-run at 0.024 BTC resistance level, testing the important yellow line. 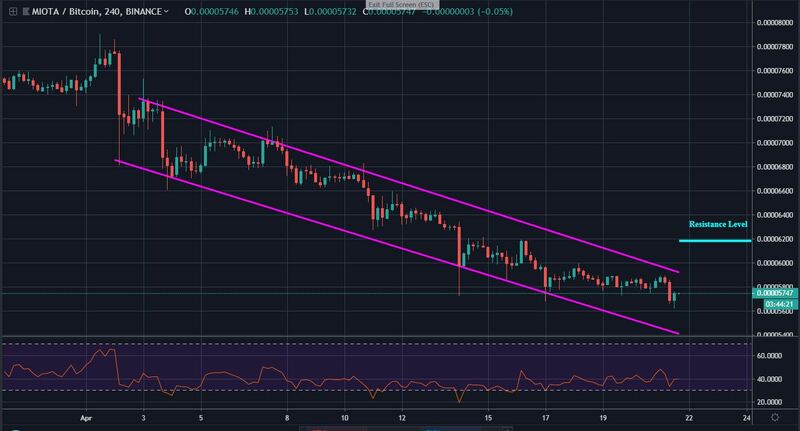 With the current market condition, this cryptocurrency may reverse the trend after reaching a solid support level which may be followed by a break-up. If otherwise, the market could further trend in a channel. As of the time of writing, IOTA is down by 3% with a market cap valuation of $846 million. 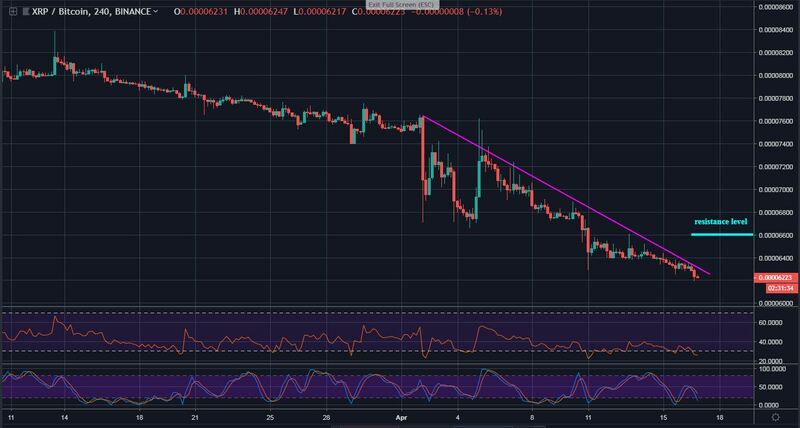 After the April 2 shock-wave, IOTA trading has been following a bearish sentiment. Meanwhile, the sellers have been gaining control ever since. The bearish reverse move is revealed on the 4-hours RSI. For the past seven days now, the price action has been moving between the range of $0.32 and $0.3 price levels. While consolidating, IOTAUSD market is currently indecisive. A surge in volatility is likely to play out. Still respecting a falling channel, a bearish surge could slump price to $0.28 support level and below. On the other hand, a bullish surge is likely to meet resistance levels at $0.33 and above. However, a significant break above the channel could set price on an upward movement. Looking at the RSI, it appeared a slow rise is converging. 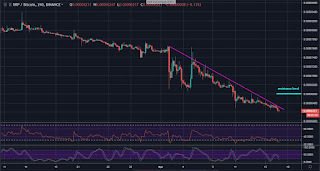 As appeared on the medium-term perspective, IOTABTC value has significantly dropped; losing about twenty percent in the past three weeks of trading. Selling pressure is dramatically approaching 5400 SAT support. 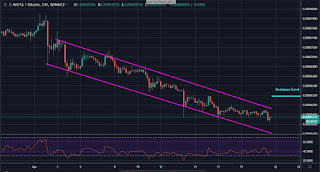 Following a bearish sentiment, the cryptocurrency has remained within the range of a channel trend. On the 4-hours RSI indicator, the slope move is revealed below the 50 level after the sharp fall in early April. A cross above the 50 level could lead to a bullish move. If such a scenario occurs, the potential resistance level to look for is 6180 SAT and above. Maintaining a trend between the ranges of the channel could further position the market in a bearish scenario. As of now, the 50 level of the RSI remains a defensive line for the bears. Barclays shares (LSE:BARC) were recently not a good market, but things are now looking promising. There is a clear bullish signal in the market. Price broke the upper Trendline to the upside more than a few times, only to return below it. This time around, price has broken above the upper Trendline again, and it may not return below it at the present. This fact is also buttressed by the signal on the RSI period 14, which has gone above the level 60, pointing farther upwards. There is a clear bullish signal in the market. BARC is supposed to reach the distribution territories at 180.00, 190.00 and 200.00 before the end of this year. HSBC Holdings stock (LSE:HSBA) has generated a clean, low-risk buy signal, following the recent discouraging conditions in the market. From November 2018 to February 2019, price consolidated seriously, and then fell lower in the following few months. Starting from the latter end of March 2019, a nice bullish trend has started. At this point, all the EMAs are sloping upwards as price remains above them. Most importantly, a Golden Cross has taken place, and that is a very good signal for bulls. The signal is still very much fresh as the market has much more room to go skywards. HSBA is supposed to reach the supply levels at 700.00, 800.00 and 900.00 before the end 2019.